Vincent, Theo and the Fox is a picture book for young readers. As kids grow, here are some of my favorite books about art for middle grade readers. Here are six chapter books by authors that I like. Some of the links are “affiliate links” to Amazon.com, which means that Amazon pays me a few pennies if you end up buying the book through the link here. Your price is the same whether you use the affiliate link or find the book another way. The pennies don’t influence my judgment. These are all books I’ve read and recommend. You’re free to click, look on Amazon and not buy. From the Mixed-Up Files of Mrs. Basil E. Frankweiler by e.l.konigsburg is for older children (8 to 12) and is as incredibly delightful today as it was when it won the Newbery Medal in 1968. Claudia, who decides to run away, wants to go someplace beautiful and comfortable, not someplace untidy like a picnic with bugs. And that’s why she goes to the Metropolitan Museum of Art. I’m quoting the book jacket here but it is because it says exactly what I want to say about this gem of a story: “It is an adventure, a mystery, a celebration of art and beauty, and most of all, a journey of self-discovery.” This is one that really makes art more exciting! Chasing Vermeer by Blue Balliett, illustrated by Brett Hellquist. This is a charming and suspenseful book. Two nerdy kids, Petra and Calder, find themselves in the middle of an international art scandal when a priceless Vermeer painting is stolen. The story is also about secret codes, puzzles and unexplained coincidences that matter. The story conveys some of the mysteries of Vermeer’s life. Although the book does not show color reproductions of Vermeer’s paintings the text gives a good sense of what it is like to look at his paintings. For example, when Calder is looking at a book of the artist’s work, he thinks, “Most of them showed people in front of a window…the same yellow jacket turned up in a number of places. The pictures made you feel as though you were peeking in at someone else’s private moment.” An exciting book! Eddie Red Undercover: Mystery on Museum Mile by Marcia Wells with illustrations by Marcos Calo is a middle grade mystery about–you guessed it–art thieves trying to steal a few Picasso paintings on New York City’s “museum mile.” I don’t remember learning that much about art (except for the fact that NYC has lots of wonderful museums) but it is a quick read with great voice. Fun book. A Nest for Celeste: A Story About Art, Inspiration, and the Meaning of Home by Henry Cole (author/illustrator). This graphic novel (for grades 3 – 5) uses a fictional mouse to introduce readers to naturalist and painter John James Audubon and his assistant, Joseph Mason. While the book does not include any of Audubon’s paintings, Cole’s illustrations are beautiful. The opening is exciting and the ending is a heartfelt reflection on what “home” really is. It was an Amazon Best Books of the Month selection when it was published in 2010. Masterpiece by Elise Broach with illustrations by Kelly Murphy is for grades 3-7. Marvin, a beetle, has the talent to make miniature drawings as good as the ones Albrect Durer made. He becomes friends with the boy, James, whose house he lives in. James, of course, gets all the credit for the drawings, which sets up some tension that is eventually resolved. Together, James and Marvin help solve the mystery of who stole the real drawings. Readers empathize with Marvin, who is one brave and resourceful beetle that kids can look up to. The book is a little like The Borrowers, a little like Chasing Vermeer and a lot like its own heartwarming tale of friendship and bravery with some good art information thrown in. Nice read! What do you think? If you know of similar books to recommend, please leave a comment below. Ted Macaluso is the author of Vincent, Theo and the Fox, a fictional adventure about the young Vincent van Gogh that teaches about growing up and learning from failure (for ages 4 – 10). He lives in Reston, Virginia with his wife, son, and kind hearted dog. Find out more at tedmacaluso.com. Fine art is beautiful but studying it can be, well, dull for too many middle grade readers. The books below grind down the dull into colorful pigments with which the authors paint gripping tales that attract readers while teaching about art. Text © 2016 by Ted Macaluso. Just Behave, Pablo Picasso! by Jonah Winter (Author), Kevin Hawkes (Illustrator). Great picture book about how Picasso stood up to harsh criticism to become one of the greatest painters of the Twentieth Century. It makes his story exciting. I wish I had written it. 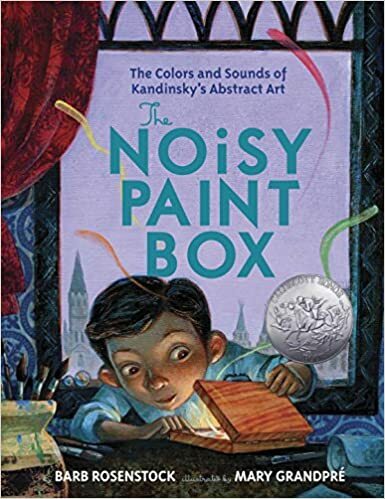 Noisy Paint Box: The Colors and Sounds of Kandinsky’s Abstract Art by Barb Rosenstock (Author) and Mary GrandPre (Illustrator). A picture book story about the condition of synesthesia and how accepting the condition helped Kandinsky become the pioneer of abstract art. When Pigasso Met Mootisse is Nina Laden’s classic book about, well, the meeting and artistic rivalry between Picasso and Matisse. Full of puns and an absolute delight. As fresh now as when it came out in 1998. Beatrix Potter and Her Paint Box by David McPhail tells how Beatrix got a point box when she was young and how that inspired her. Through Georgia’s Eyes by Rachel Rodriguez (Author) and Julie Paschkis (Illustrator). Very pretty picture book about Georgia O’Keefe. The Fantastic Jungles of Henri Rousseau written by Michelle Merkel, illustrated by Amanda Hall. A picture book that tells us its never too late to teach yourself how to paint. My Name Is Georgia by Jeanette Winter. Very nice book about Georgia O’Keefe. Swatch: The Girl Who Loved Color by Julia Denos is–surprise–about color. Swatch lives where colors run wild. She attempts to tame them and put them in jars until the day she meets Yellowest Yellow, who does NOT want to be tamed (and is a little fierce). Author/illustrator Julia Denos has illustrated several children’s books and says the hardest question for her to answer is “What is your favorite color?” This delightful book is her answer. Preschool – Grade 2. Vincent Paints His House by Tedd Arnold. Cute book about color. It teaches kids in a fun way that every basic color has at least four versions (e.g., red can be rose, crimson, scarlet, or vermilion). Too Much Glue by Jason Lefebvre (writer) and Zac Retz. This made me laugh! It’s not really about art; it’s about what can happen in art class. Great twist at the end. Daniel Finds a Poem by Micha Archer. Beautifully illustrated book addresses the question, “What is Poetry?” The book’s answer ties everything together in a neat way. I love that it is a boy finding poetry and that, in the next book below, a woman is navigating the high seas. Dare the Wind: The Record-Breaking Voyage of Eleanor Prentiss and the Flying Cloud written by Tracey Fern and illustrated by Emily Arnold McCully. This is an exciting read and I couldn’t put it down. Eleanor became a great navigator and she led her husband’s boat from New York, around Cape Horn and on to San Francisco in record-breaking time. Storms, broken masts, a woman winning by skill and guts and a quicker grasp of science than competing navigators! The language is beautiful. Here is one example: “Ellen’s heart raced like a riptide….” The illustrations are perfect. Did I say I like this book? I do. A lot! Chalk by Bill Thomson. You don’t “read” this exciting book–the pictures give the whole story. It is almost like a movie and gets just scary enough. The illustrations make me wish I could draw! The Song of Delphine by Kenneth Kraegel. Cinderella meets Where The Wild Things Are. Lovely book. Magical trips on giraffes. Drum Dream Girl. How One Girl’s Courage Changed Music by Margarita Engle, illustrated by Rafael Lopez. Picture book about Millo Castro Zaldarriaga who, in 1932, overturned the Cuban tradition that only boys could play drums. She became a world famous musician. In a Village by the Sea, written by Muon Van and illustrated by April Chu features (in one part) a cricket who paints up a storm that endangers the fisherman-father. It gives young readers a sense of the risky lives of fishermen and their families. But the story has a good ending and the illustrations are very beautiful. I really like that the book is not “saccharine:” we do not see the father come home safely, it is implied by the art. Great book to spark conversation with your child! Math at the Art Museum is written by Group Majoongmul and illustrated by Yun-ju Kim. The book is primarily pedagogical (rather than a gripping story like the other books on this page). I include it because there are too few books that combine art and math and because I really liked the painting the book uses to illustrate symmetry: Praying Mother and Son Rock Formation by Kim Jae-hong. The Hare & the Hedgehog is the classic story by the Brothers Grimm. This version was recently published with gorgeous illustrations by Jonas Laustroer. Not directly about art, but a beautiful book. Clowns On Vacation by Nina Laden. Hey, its Nina Laden. Do I need to say more? Langston’s Train Ride by Robert Burleigh (Author) and Leonard Jenkins (Illustrator). A picture book that captures how creativity strikes. It is about the moment that inspired one of Hughes’ most famous early poems. “In the beautiful countryside in southern France…I used to do an ugly thing.” So begins the confession of a childhood bully in The Artist and Me, a wonderful new book which is about both Vincent van Gogh and the causes and consequences of bullying. It complements the now classic text, Camille and the Sunflowers, which addresses the same period in van Gogh’s life from the opposite perspective: compassion. I have a soft spot for children’s books about artists that also teach about life. So when I found this book in the gift shop at The Phillips Collection in Washington, D.C. I bought it immediately. Having read it, I’m very glad I did. Written by Shane Peacock and illustrated by Sophie Casson, The Artist and Me is a brand new picture book (ages 5 – 9) about both bullying and Vincent van Gogh. The artist was misunderstood during his life and tormented by both inner demons and public criticism of his appearance and eccentric behavior. The contrast between van Gogh, the artistic genius, and van Gogh, the disheveled human man, became intense when he moved to the French country town of Arles. Van Gogh created some of his most beloved paintings in the few months that he lived in Arles. But he had few friends there, many of the townsfolk complained about him, and their children would tease him. Another, earlier, book, Camille and the Sunflowers by Laurence Anholt, also addresses this period of van Gogh’s life, doing so from the perspective of Camille Roulin, the son of the Postman Roulin who was immortalized in several paintings by van Gogh. Anholt’s 1994 book recounts how Camille and his father help van Gogh when he was a poor stranger arriving in town. The father models good behavior and Camille becomes friends with van Gogh, despite area children who tease the artist. When Camille feels helpless, because he cannot defend his new friend, his father helps him understand his feelings. Camille learns compassion and hope from his father and from his friendship with van Gogh. The book is about the facts of van Gogh’s life but it is also about a boy learning what compassion means. As the story progresses, its protagonist hears–but does not yet understand–van Gogh’s mission: “to tell the truth by painting pictures.” Then, one day, he is alone in the countryside and accidentally encounters van Gogh painting in a wheat field. The boy sees what van Gogh sees, but is terrified: “for an instant the world was bigger and brighter than it had ever been.” Van Gogh, who knows the boy is terrified, is kind; with his face glowing “like the pictures I had seen of saints in churches” the artist offers to give him the painting he just made of the wheat field. Still scared–perhaps by the artist’s kindness in the face of bullying, perhaps by the intensity of the beauty van Gogh is painting, perhaps in shame at his earlier rude treatment of van Gogh, perhaps in fear of what villagers would think if they saw he had befriended van Gogh–the boy runs away. I won’t reveal the book’s ending, but it is perfect and fitting and a valuable lesson on how wrong people can be about people who are different. The ending is a lesson about how bullies can change and grow. It is a lesson about the rewards of artistic integrity. The Artist and Me is a Junior Library Guild selection and I highly recommend it. The illustrations capture not just the meanness of bullying (as in the example above), but also the yellow, green and gold hues of the French country side memorialized in van Gogh’s work. Casson’s paintings of the bully capture his youthful wonder and fear; she poignantly depicts the chagrin and self-reflection he later experiences as an adult. Her depiction of van Gogh in the midst of inspiration, when his face is glowing like a saint, is, by itself, worth the price of the book. The text is lyrical and subtle. It works like the best picture books should, with the pictures telling and foreshadowing the story in partnership with the words. Stories of real life–whether it is the dark side of bullying and fear of things that are different, on the one hand, or, on the other, the bright side of courage, compassion, standing up for oneself, choosing a path in life, or overcoming adversity–are important for children. Finding those themes in the context of the arts gives the readers of such books an experience that goes beyond facts and inspires them to think about their own life choices. Such books make art more fun and relevant for children. I urge you to find The Artist and Me at your library, local bookstore, or here on Amazon.com (affiliate link). Illustration © 2016 by Sophie Casson. Image detail used under “fair use” law for purposes of review. Text © 2016 by Ted Macaluso. May be freely reproduced provided attribution back to http://www.tedmacaluso.com is given.